New fabs and lines are expected to invest over $220 billion for equipment. Global fab equipment spending will increase 14 percent this year to US$62.8 billion and is expected to rise 7.5 percent, to US$67.5 billion, in 2019, marking the fourth consecutive year of spending growth and the highest investment year for fab equipment in the history of the industry, according to the latest World Fab Forecast Report published by SEMI. Investments in new fab construction are also nearing a record with a fourth consecutive year of growth predicted and capital outlays next year approaching US$17 billion. Investments for fab technology and product upgrades, as well as for additional capacity, will grow as the emergence of numerous new fabs significantly boosts equipment demand. 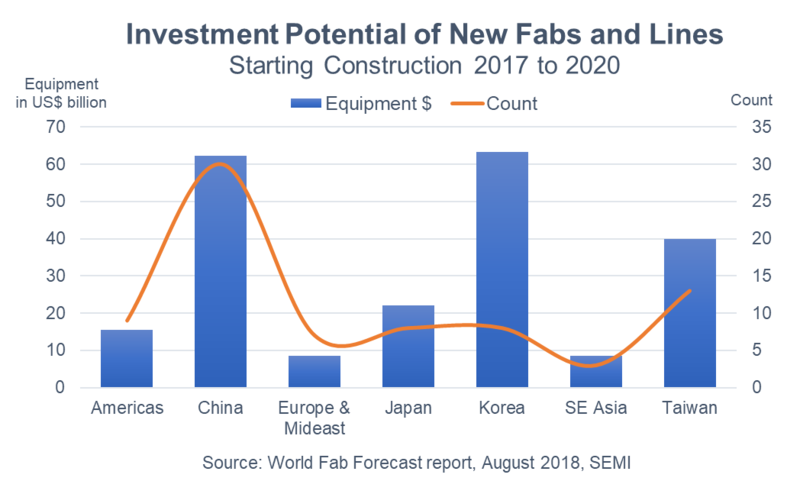 The World Fab Forecast Report currently tracks 78 new fabs and lines that have or will start construction between 2017 to 2020 (with various probabilities) and will eventually require more US$220 billion in fab equipment. See Figure 1. Construction spending for these fabs and lines is expected to reach US$53 billion during this period. Figure 1: Shows the investment potential of new fabs and lines starting construction between 2017 and 2020. Korea is projected to lead other regions in fab equipment investments with US$63 billion, US$1 billion more than second-place China. Taiwan is expected to claim the third spot at US$40 billon, followed by Japan at US$22 billion and the Americas at US$15 billion. Europe and Southeast Asia will share sixth place, with investments totaling US$8 billion each. Fully 60 percent of these fabs will serve the Memory sector (the lion’s share will be 3D NAND), and a third will go to Foundry. Of the 78 fab construction projects starting construction between 2017 and 2020, 59 began construction in the first two years (2017 and 2018), while 19 are expected to begin in the last two years (2019 and 2020) of the tracking period. Equipping a new fab typically takes one to one and a half years, though some fabs take two years and others longer, depending on various factors as such the company, fab size, product type and region. Roughly half of the projected US$220 billion will be spent from 2017 and 2020, with less than 10 percent invested in 2017 and 2018, nearly 40 percent in 2019 and 2020, and the rest after 2020. While the US$220 billion estimate is based on current insights of known and announced fab plans, total spending could exceed this level as many companies continue to announce plans for new fabs. Since the last quarterly publication of the report published last quarter, 18 new records – all new fabs – have been added to the forecast. Up-to-date and detailed analysis, with a bottoms-up approach, is available by subscribing to SEMI’s World Fab Forecast Report. Since its June 1st publication, more than 340 updates have been made to the World Fab Forecast. 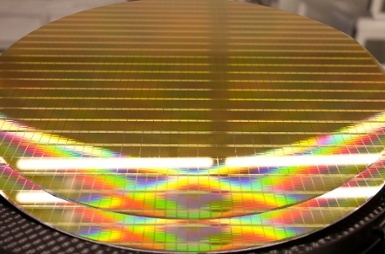 The report now includes more than 1,200 records of current and future front-end semiconductor facilities from high-volume production to research and development. The report covers data and predictions through 2019, including milestones, detailed investments by quarter, product types, technology nodes and capacities down to fab and project level.